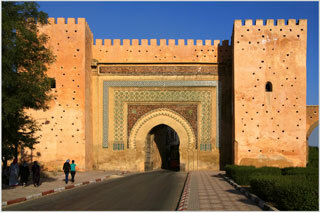 Founded in the 11th century by the Almoravids as a military settlement, Meknes became a capital under Sultan Moulay Ismaïl (1672–1727), the founder of the Alawite dynasty. The sultan turned it into a impressive city in Spanish-Moorish style, surrounded by high walls with great doors, where the harmonious blending of the Islamic and European styles of the 17th century Maghreb are still evident today. This article uses material from UNESCO World Heritage List article "Meknes", which is released under the Creative Commons Attribution-Share-Alike 3.0 IGO License.